Description: Melissa is a nobody. Wilf is a slacker. Bondi is a show-off. At least that's what their middle school teachers think. To everyone's surprise, they are the three students chosen to compete for a ten thousand-dollar scholarship, solving clues that lead them to various locations around Chicago. At first the three contestants work independently, but it doesn't take long before each begins to wonder whether the competition is a sham. It's only by secretly joining forces and using their unique talents that the trio is able to uncover the truth behind the Ambrose Deception--a truth that involves a lot more than just a scholarship. 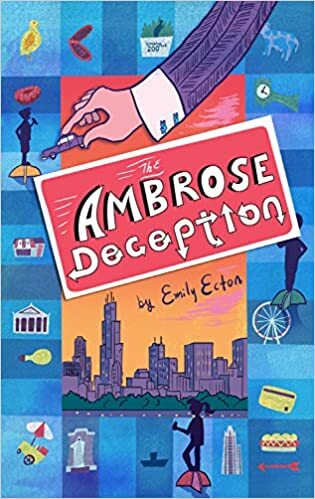 My Thoughts: THE AMBROSE DECEPTION is a middle grade treasure hunt. Melissa, Wilf, and Bondi are chosen from their middle schools to compete in a contest that will give the winner a $10,000 scholarship. Each is given a cellphone, a debit card, a driver and three riddles to solve. Melissa lives with her brother and her grandmother. She makes money for lunches and bus fare by doing homework for other students. Otherwise, she is managing to make her way through middle school really under the radar. Bondi is a show-off who has a great sense of smell and a mother who is fixated on kale. Wilf is a slacker who is determined to work through his "to do" list now that he has a driver and debit card and may get to the clues eventually. The three kids work independently at first. But soon begin to think that it is a scam orchestrated by "Mr. Smith" for some nefarious purpose. It turns out that all the clues they are following are part of the will of billionaire Enoch Ambrose who has recently died. The ones who solve the riddle will inherit his fortune. I liked the tour of Chicago that this book takes us on. The places mentioned are all real and all sound intriguing. I liked how the kids all worked together once they realized that the scholarship deal was a scam. This was a fun middle grade mystery/treasure hunt. "The chose Wilf. Wilf Samson? They didn't even pick a believable kid." "Honestly, I can think of a hundred kids more qualified than Bondi Johnson." "She's not one of my Shining Star gifted students, she's not in any of the Racing Rocket athletic programs, shen't not in Mathletes or BandTastic or Chess-perts or the Jazzercise Singers or even the AV club. She's not in anything. She's a complete nobody."